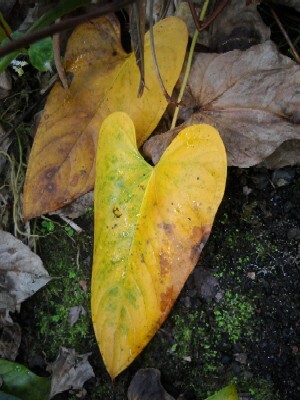 Ever wonder why your anthurium’s leaves are turning brown? Here are four possible reasons. At some point all leaves get old and they die. When this happens they start to turn yellow and then they start to turn brown. This is perfectly natural and perfectly normal. You can leave old leaves on the plant and let them fall off naturally. But in general I like to trim them off, since this makes our plants look better. Just remember to sterilize your cutting shears before doing this with a little rubbing alcohol. Or you can break of the leaves with your hands, grasp the base of the petiole and apply a downward pressure and the leaf should snap off. Why are these anthurium leaves turning brown? If you have placed your plant in a spot where it can receive direct sunlight, it might be getting sun burnt. If all the leaves start to turn yellow at the same time and then start to turn brown, this may be a sign of sunburn. Try moving your anthurium to a slightly less sunny location or try to filter out a portion of the sunlight with a thin, filmy curtain. Or you can have the window next to your anthurium plant tinted. If you use a curtain, remember that it shouldn’t block out all of the sunlight. It should only block a portion of it. If your plant has started growing slower than normal or if its new leaves are smaller than its old leaves, it may be suffering from a nutrient deficiency. Deficiencies in the major macro nutrients like Nitrogen, Phosphorous or Potassium can all cause leaves to turn brown, so can deficiencies in Calcium or Magnesium. If nutrition is the issue, you can resolve it by using a liquid fertilizer for a few weeks. And after your plant has recovered you can switch to a controlled release fertilizer. When using liquid fertilizer dilute it to about 25% of the strength recommended on the label and use it once per week. Once your plant recovers, you can use it every two weeks or switch to controlled release fertilizer. Fungal problems (like root rot) can also cause leaves to turn brown. In addition you can be feeding your plant well and it won’t be able to absorb the nutrition if its root system is compromised. If the roots of your plant are turning brown or black and feel mushy or slimy this is a sign of root rot. Healthy roots should be whitish or pinkish. If your plants roots don’t look so good, your best bet is to repot your plant. Make sure you use a good potting soil that drains well. To make a potting soil drain well you should incorporate redwood bark or perlite. When repotting your plant trim off the diseased portions of its main stem and roots using sterilized shears. After repotting be very careful with watering, never let your plant’s soil dry out completely, but conversely you must make sure that it never becomes soaking wet. Excess water allows nasty fungi to grow and causes root rot.